El Nido means 'The Nest'. It is a perfect place to curl up and forget about the world and its cares. Only a few minutes walk from Orgiva, with its shops, bars and restaurants, El Nido lies in the valley of the Rio Chico amidst stone walled orchards of oranges and olives. Starting from the ruins of an ancient stone farm, a local architect and interior designer created this delightful holiday home in a traditional style with modern comforts. This is fully licenced with theTourist board. Registration Number VTAR/GR/000864. Pets are welcome and garden is fully fenced. Good dog walking area. Private swimming pool. Ainsley and I have lived around the Orgiva area for the last 20 plus years and have had various businesses including our 2 holiday cottages. We live next door to the cottage and are on hand in case of need along with our dog cat and 1 chicken. We look after the cottage ourselves. The area is very unspoilt as there is no industry here and we have the cleanest air in Europe. We have spanish neighbours and live in the countryside but within easy access to the local town of Orgiva and we can walk within a few minutes into town so we do not have to drive all the time. We are 454 metres above sea level and are a short drive away from the white washed villages on the southern slopes of the sierra nevada mountain range. The coast and beaches are a 30 minute drive and have larger shops and clean beaches too so we have the best of both worlds. Airports are easy to drive to as the motorway is 15 minutes away. The cottage is very well equipped and as we are living here we can be of assistance to aid your holiday experience in case of any questions or give you help if you may need. We are to be found next door but we keep ourselves to ourselves so not to interrupt your holidays and we make sure the pool and garden are kept clean before you awake! We make bread if you want and the chicken can provide fresh eggs and we usually have fresh veg. from the gardens around us if you want to sample some of the local produce. The town of Orgiva has everything you need so you do not need to bring "the kitchen sink" and we have really good internet access with wifi in the cottage. Bathroom with bath/shower, basin, bidet, wc, heated towel rail and infra red heater. 2nd bathroom with shower and washbasin, heated towel rail and infra red heater. Indoor dining/living room with dining table, chairs, TV/DVD, plus DVD collection, books and games, settee. Good information pack and lots of maps. Kitchen with double sink, 4 burner gas hob, full size electric oven, fridge, dishwasher, microwave, juicers, breakfast table and ironing facilities. Very well kitted out. Washing machine. Dishwasher. Motril about 30 minutes away has a golf links course and Granada also has a good golf course. this is for the use of the guests in el nido only. Notes on accommodation: Water is heated by solar water heater with electric immersion backup. The building has well insulated walls and roofs and through ventilation, mains electricity and good piped water, tiled floors with rugs. TV with Spanish channels. Fans provided. There is plenty of space for a baby - cot provided. Very comfortable accommodation for couples or a family and is decorated with plenty of attention to detail. We also have full internet access free of charge. Outside: An irrigation stream gurgles past the entrance gate. Amongst olive, orange and lemon trees is a sheltered patio with a barbecue and sun loungers. When not exploring this wonderful region, you can swim in the enchanting pool (10m x 5m). Pool is fenced off from the garden for safety. Clare and Ainsley look after El Nido and will be pleased to provide assistance if you need anything. Ainsley is a professional chef and, to order, will deliver delicious meals to your table. Cleaning / Towels / Linen / Maid service: Linen and towels are provided including beach towels, and a comprehensive information file about the area, restaurants, walks, etc. Property is cleaned for your arrival. Other: Full internet facilites with laptop to use. Wifi. Free of charge. If there are only 2 of you the second bedroom converts to an extra living area. Beaches at Salobreña/Motril on the Costa Tropical 30 minutes. It is possible to fly to Granada from the UK. Malaga airport is an hour and a half away mostly easy motorway driving. Non car users will find its location very amenable and Clare and Ainsley are available for airport pickup and day trips. However, car hire can be booked via the internet for pickup at Malaga airport. Almeria airport is also within 2 hours. Orgiva short walk/drive away - 5 minutes. Granada 50 minutes. Nerja 50 minutes. Trip into the higher mountains approximately 20 minutes. 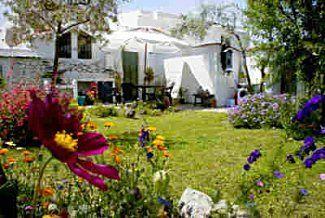 Orgiva is at the heart of Las Alpujarras, the beautiful valleys and foothills between the Sierra Nevada and the coastal range. Of great interest to walkers, birdwatchers, botanists, writers and painters or just for a great holiday away from it all. Many activities including pony trekking, hang-gliding, golf and skiing. The last outposts of the Moors after the fall of Granada in the 16th Century, their Berber villages dot the mountainsides. Ski slopes 95 minutes. Meal on arrival and shopping service and airport pickup are also available. For further details please see the 'Extras Index' on our website link below.